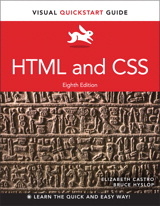 Welcome to the companion site for HTML and CSS, Eighth Edition: Visual Quickstart Guide by Elizabeth Castro and Bruce Hyslop. This best-selling book's visual format and step-by-step, task-based instructions is ideal for beginners and intermediate coders and designers. This updated edition uses clear instructions and friendly prose to introduce you to HTML and CSS essentials. No prior knowledge is assumed. Real-world code samples help you learn HTML and CSS from the ground up. Mark up webpage content with HTML and apply your designs with CSS. Prepare and add images to your pages while making them load quickly. Style text, add background colors and images, and implement a multicolumn layout. Use margins, padding, positioning, and more in your layouts. Create pages according to responsive web design techniques so they will look good on mobile phones, tablets, laptops, desktops, and beyond. Apply effects that CSS3 brings to CSS, including rounded corners, text shadows, drop shadows, gradients, multiple backgrounds, alpha transparent colors, opacity, and more. Implement CSS sprites so your pages load fewer images and speed up as a result. Use web fonts to enrich webpage typography and to add scalable icons to your pages. Build HTML forms (including with many of the features HTML5 brings to forms). Add HTML5 video and audio to your pages, and include a Flash fallback for older browsers. Improve your site's accessibility with ARIA landmark roles and other good coding practices. Obtain your own domain name, test and debug your site, and publish it to the web for all to see. Accommodate older browsers while using newer features they don't support. Implement best practices that industry professionals follow.